I like following recipes when I cook. I can take a pile of ingredients and make dinner when I need to. But I like order and I like lists and I like continuity. And I hate wire hangers. But this dish didn’t quite start with a real clear-cut plan when I ran into HEB for pork tenderloin to make this recipe and found salmon on sale instead. And I couldn’t pass up on-sale salmon that was already sliced into nice, center-thickness 6oz portions. And they were so perfectly lined up in the seafood case. I simply wrapped those salmon filets in foil with green beans and those same basic flavors from the tenderloin recipe, threw it in the oven, and then said hi to the dish that we’d go on to eat 4 times in 2 weeks (and is on my menu again this weekend). 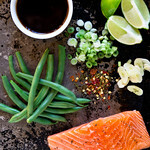 The salmon was perfectly cooked and the simple flavors don’t overwhelm the fish. The green beans end up in that nice grey area between just tender and still crisp. It comes together quickly and clean-up is a breeze. But best of all, the lighter dinner was super welcome as we headed into and out of the holiday dinner cream cheese & carbs overload. 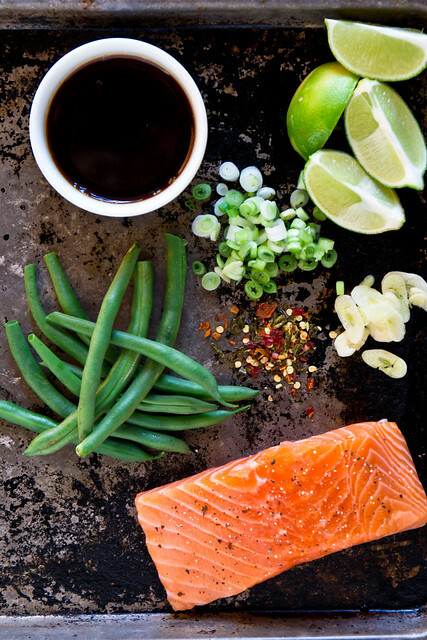 Salmon is glazed with honey, soy sauce (or coconut aminos), and lime and then baked foil packet-style with garlic and fresh green beans. Whisk soy/coconut aminos and honey together in a small bowl (a few seconds in the microwave will help if it's slow to come together). Brush each filet with honey mixture until it's gone. Place green beans on top of the filet (they won't all stay) and top with garlic slices, a drizzle of olive oil, and a pinch of salt. Seal the foil packet - bring the right and left sides together and fold down, sealing, and then fold up each end to seal. Love this! Fish in a packet is one of my fav simple meals, and this version looks super tasty! Amazing! I’ve always wanted to try the foil packet method! The.Boy. and I definitely need some of this in our lives! Healthy and oh so satisfying. This sounds like an easy weeknight dinner! And yummy to boot. Hi there, I just found your blog through pinterest and wow, it’s super. I’ve always cooked my salmon in foil with lemon juice and i adore it like that. honestly, i’ve never thought to try other ‘add-ins’ and this sounds incredible. These flavors sound amazing! Fish has been seriously lacking in my meal plan lately and I think it’s time I correct that! Checking back in – I made this for dinner tonight and we loved it! Jesse wasn’t super excited when I told him we were having salmon for dinner, but he gobbled up his entire plate and said, “That was pretty good.” Coming from a guy that claims to not like cooked salmon, big compliment. Thanks! This is going on the meal plan FOR SURE. I was lured to this blog for your Fresh Strawberry Cake, but it’s recipes like this that keep me coming back for more. Simple, flavorful and surprisingly healthy food that DH asks for again. Thank you! I knew when this recipe popped up on my reader, it would be a hit with my family. I served it with quinoa, and it was an absolutely delicious dinner that we all loved, not to mention a cinch to prepare. This will definitely be a repeat meal in our house! We absolutely LOVE this dish! So easy to prep and cleanup is a dream! It’s a great way to hit the reset button after a weekend of gluttony (which sometimes is inevitable). So glad you shared!